Find your potential in your running, in a fun and positively impactful way by Accessing your Running Magic! The Accessing Running Magic Online Course is in the pipeline, whoop whoop! “Thank you so much for the wonderful session! It’s really helpful for me…I have become more aware of my body especially breathing, stretching and my overall running form. As always, you can catch the weekly updates with the latest blog by staying connected..
Keep reading to find out more about Accessing your Running Magic! Everyone can run because running is about moving. Learn how to move better, and you’ll run better! 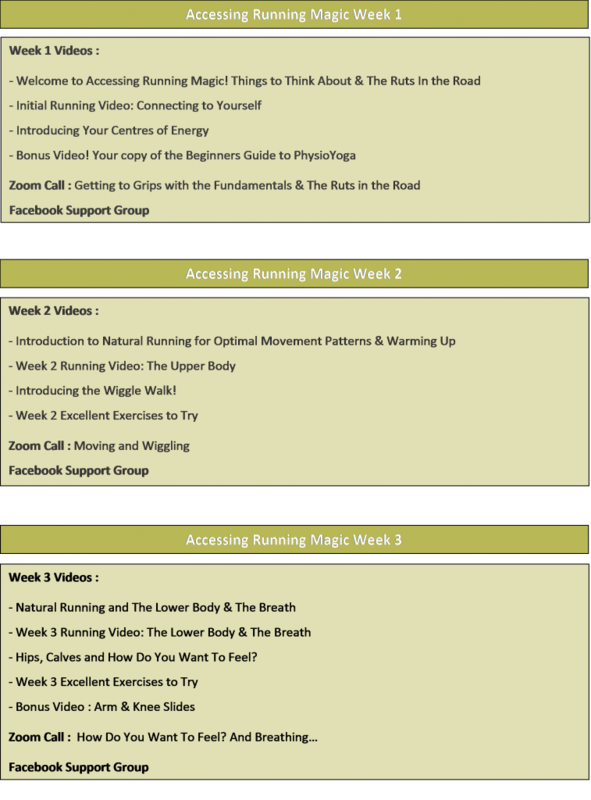 Accessing Running Magic is a 4-week online course that which takes your running, turns it on its head and puts it back together again. Comfortably. Easily. Smoothly. Powerfully. And pain-free. Maybe you’ve recently embarked on a new relationship with your trainers? Maybe a whole new world of patterned lycra, sports bras, and the runners high has opened itself up to you?! Perhaps you’ve entered a race or two, and maybe the Parkrun is now a staple fixture in your week..? Perhaps you’ve found a super supportive group with whom to go out running…but maybe your running is still a monumental effort. Maybe your running friends seem to be ‘getting away from you’…and yet you’re putting in the same amount of effort. Maybe you’ve had your first running injury…(and its accompanying frustrated mood swings!?) Perhaps you’ve spent a bucket load at the sports shoe shop…and walked out with in soles and another new pair of pumps…and are just hoping this is the answer to your running woes! No doubt you’ve been furiously googling ‘running injuries’, gleaning as much info from everyone you possibly can…so that you can get back out there and don’t lose all of that fitness that you worked so incredibly hard to gain! Maybe you’re going slightly mad with all the time that you’re spending indoors researching on the computer…when the point was to be outside and getting active! How does it do that?! During each week of the 4 week course, a series of videos are uploaded to your Living Green Health (LGH) account for you to access and to work through. In addition, there’s a weekly Zoom call with Dawn where she supports you with key elements of the week and offers you the opportunity to raise any questions and gain further insights. 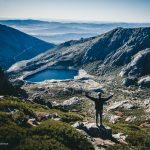 What’s more is that there is a private Facebook group for you to share your successes and to air your challenges, and to connect with others who are progressing along their running journey at the same time. 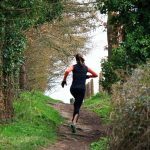 Throughout the Accessing Running Magic online course you will see an improvement in your running – …whether ‘improvement’ for you means getting stronger and faster, or whether it means knowing how to best help your body to avoid getting injured. Or whether that means having more fun from your running (!) and staying motivated. You will also gain a better connection to yourself both during your running and during your day to day, though a series of running activities as well as series of complementary indoor, physiotherapy-based exercises. You will gain a deep understanding of how and why our movement patterns are connected with our running and how to release sticking blocks. “I did Dawn’s sessions…and took a minute off my 5k time that week! I know what a difference it can make. To provide a safe, supported space to learn, explore and comfortably practice powerful techniques to make your running light, smooth and easy. To facilitate that learning within your own environment, but keeping you connected to a brilliant group of like-mindeds all aiming to optimise their own running experience! …if you’re starting out on your running journey, whether you’re getting to grips with C25K, Parkrun or whether you’re aiming for your first half marathon, or even marathon! Or maybe you’re aiming to improve your time from last time and would like to ! It’s for you if you want to learn how to optimise your running, and how to take care of your body to best complement your running. If you enjoy receiving new information and like trying it out with an inquisitiveness (and a smile). This course is for you if you’re keen to dedicate 4 weeks to progressing through the videos and handouts, trying out the activities, and reflecting on the insights that you discover. You will need to be able to play with the outdoor running activities, and you’ll need a little bit of indoor space to (preferably) lay down a yoga mat or towel to have a go at the exercises. And a sense of play and exploration! How does the course unfold? And how best to recover from running : taking care of yourself outside of your running! There will be a Zoom call on Wednesday evening that you can join in live, or watch again when it’s posted along with your following week’s material. The Facebook group will be available throughout the course – and afterwards! – for you to connect with and mutually support one another making some new discoveries! If you’re itching to join the course! Once we’re ready to open the doors to the Accessing Running Magic Online Course, we’ll have an application form so that we can ascertain that Accessing Running Magic really is the best option for you! We have other courses if you’ve been running for a long time*, or are looking for 1-1 input for your running (take a look at the Online Movement Analysis Sessions). *If you have been running for a good while, but would still like to benefit from the group learning here, please feel free to join us if you wish! You are by no means excluded from the fun. Accessing Running Magic Application Form – Coming Soon! Once your application form has been submitted and reviewed, you will receive a Welcome Email with a link to the Checkout Page for the Accessing Running Magic Online Course page. Here you will be able to pay, and you’ll be prompted to create a Living Green Health Account, which it’s advised that you do. The LGH Account is where you’ll be able to access all of the course videos and information in one place, although you’ll receive emails with the information as well. Drop a line to dawn@livinggreenhealth.co.uk to register your interest – we’d love you to join us! Clearly, investing in ourselves is priceless. 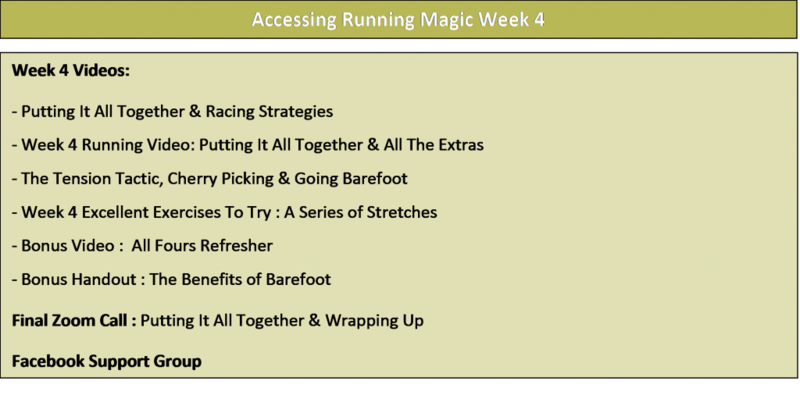 However, for ease sake, we have put a price tag on the Accessing Running Magic Online Course, which is £135. We aim to offer you supreme amounts of fun and value for that – tonnes of learning points for your running (which are guaranteed to spill over into the rest of your life : ) and stacks and stacks to try out and implement in your running. We’ve had so much positive feedback about the in-person course, in the past, that we really don’t think that you’ll be disappointed – it’s like getting to work with your own physio and running-specialist for a month! Once again, be the first to know when the registration gates open here, and please do stay in touch with us until then! As a physiotherapist who has been running forever, I’ve spent the last 10 years honing my movement analysis skills, my knowledge of the biomechanics of natural running as well as an intuitive understanding of runners’ individual movement patterns, and ways to positively influence them. 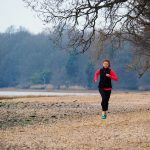 I developed the Accessing Running Magic course to combine these skills together with my physiotherapy and yoga experience primarily (although not exclusively) for women, having understood how much scope there is to help women reach their potential in their running. I’ve also spent a tremendous amount of time successfully trying this out in my own running! How many places are there on the course? The places are limited! Each course will have an upper limit, so that we can make sure that everyone has the best experience possible on the course. This includes giving everyone access to the Zoom calls as well as the chance to be a happy contributor in the Facebook group. What happens if I sign up and then I can’t follow the videos or make the calls? You will have access to the material for good once the course has started, so you don’t need to worry about falling behind, or missing out! What if I change my mind about taking part in the course? We don’t offer a refund on the Accessing Running Magic course, mostly because you are given access to the material for (hopefully happily! )ever after. Can I bring some friends along? Yes, please do invite your friends to join you on the course! We only ask that every one of you sign up and pay individually. As you will appreciate, we want to you be empowered along with your friends but it’s also really key to mention that this is Dawn’s work, and if one person pays and several people use the same resources, this really won’t feel very good to anyone. Thanks so much for your courteous consideration with this. If you don’t have the funds to pay now but are super keen to take part in the course – please please please create a separate savings pot so that you can join us on another occasion; we’d love to have your company! In addition, stay connected for info and offers!